The accidental revelation in mid-November that U.S. federal prosecutors had secretly filed charges against WikiLeaks founder Julian Assange underlines the determination of the Trump administration to end Assange’s asylum in the Ecuadorian Embassy in London, where he has been staying since 2012. Behind the revelation of those secret charges for supposedly threatening U.S. national security is a murky story of a political ploy by the Ecuadorean and British governments to create a phony rationale for ousting Assange from the embassy. The two regimes agreed to base their plan on the claim that Assange was conspiring to flee to Russia. Then came a significant change of government in Ecuador — an April 2, 2017 runoff election that brought centrist Lenin Moreno to power. Moreno’s win brought to an end the 10-year tenure of the popular leftist President Rafael Correa, who had granted Assange political asylum. For his part, Moreno is eager to join the neoliberal economic system, making his government highly vulnerable to U.S. economic and political influence. Eleven days after Moreno’s election, CIA director Mike Pompeo resumed the attack on Assange. He accused WikiLeaks of being a “hostile non-state intelligence service.” That was the first indication that the U.S. national security state intends to seek a conviction of Assange under the authoritarian Espionage Act of 2017, which would require the government to show that WikiLeaks did more than merely publish material. But the U.K. Foreign and Commonwealth Office, which was responsive to U.S. wishes, refused to recognize Assange’s diplomatic credentials. 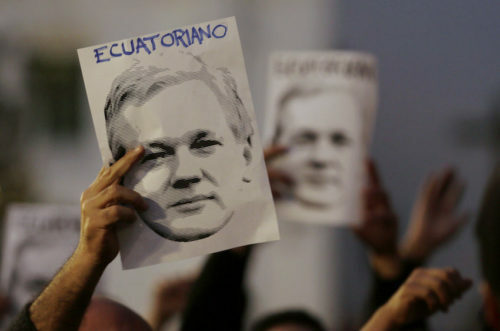 The foreign office stated that Ecuador “knows that the way to resolve this issue is for Julian Assange to leave the embassy to face justice.” On December 29, 2017, the Ecuadorian government withdrew Assange’s diplomatic credentials. The Trump administration then took a more aggressive stance toward Assange and the policy of the Moreno government. Under Secretary of State for Political Affairs Thomas A. Shannon Jr. visited Ecuador in late February 2018, and he was followed in March by Deputy Commander of the U.S. Southern Command, Gen. Joseph DiSalvo, whose task was to discuss security cooperation with the Ecuadorean military leadership. Ecuador’s economic situation offered further opportunity for U.S. leverage at that time. The steep drop in the price of Ecuador’s oil exports had caused the South American nation’s politically sensitive domestic fiscal deficit to increase rapidly. In mid-June of 2018 an International Monetary Fund delegation made the organization’s first trip to Quito in many years in an effort to review the problem. A report by J. P. Morgan released immediately after the IMF’s mission suggested that it was now likely that the Moreno government would seek a loan from the IMF. The regime had previously sought to avoid such a move, because it would create potential domestic political difficulties. Seeking an IMF loan would make Ecuador more dependent than before on political support from the United States. In late July 2018, Moreno, then in Madrid, confirmed that he was involved in negotiations with the U.K. government on the issue of Assange’s status. The Intercept’s Glenn Greenwald reported that a source close to the Ecuadorean foreign ministry and the president’s office had warned privately that the two administrations were close to an agreement that would hand Assange over to the U.K. government. He reported further that it would depend on unidentified assurances from the United States. On September 21, 2018, the Guardian published an article titled “Revealed: Russia’s secret plan to help Julian Assange escape from the UK.” In that story, Guardian reporters Stephanie Kirchgaessner, Dan Collyns and Luke Harding asserted that Russia had devised a plot to “smuggle” Assange out of the embassy in a diplomatic car and then whisk him out of the U.K. The authors also claimed that Moscow had negotiated the alleged plot with a close Ecuadorian confidant of Assange and suggested that the scheme raised “new questions about Assange’s ties to the Kremlin”. In a September 28, 2018 story for ABC News, reporters James Gordon Meek, Sean Langan and Aicha El Hammar Castano reported that ABC had “reviewed and authenticated” Ecuadorean documents, including a December 19, 2017 directive from the Foreign Ministry on posting Assange in Moscow. They noted, however, that the documents “did not indicate whether Assange knew of the Ecuadorean directive at the time.” The ABC story relied on unnamed Ecuadorean officials who, the reporters said, had “confirmed” the authenticity of those documents. This article was posted on Tuesday, November 27th, 2018 at 1:20pm and is filed under Ecuador, Julian Assange, Russia, United Kingdom, United States, US Hypocrisy, US Lies, WikiLeaks.